Jill Of All Trades: Get.Set.Bolt. What comes to your mind first when you hear the word 'Bolt'? A bolt of lightning? Fast and powerful? The bolt (nuts and bolts) that's made out of metal? Or from the Movie named Bolt starring a canine who has superpowers? What if I told you that the Bolt I witnessed today has the features of all the three mentioned above, and is way cooler? I have always been a hatchback gal. I find sedans too big to drive in metro-cities like Mumbai, and SUVs too manly. Parking woes, narrow lanes etc are best dealt with a cute hatchback! Truth be said, a Mini Cooper is my all time dream car, but it will take me years to own that. I am a loyal Tata Motors fan, currently owning the Tata Nano LX. 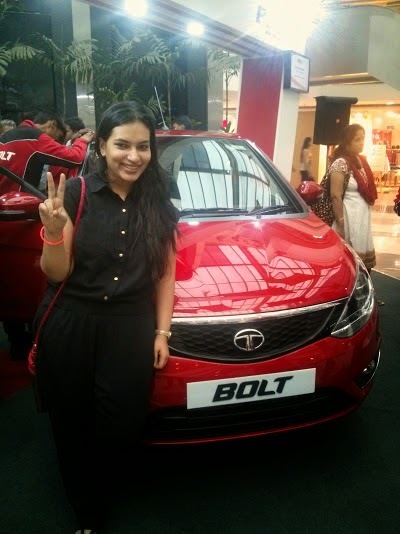 I was completely thrilled with the features of the Bolt when I checked it out at Inorbit Mall, Vashi, Navi Mumbai today! So you can opt to choose a speed as per usage. Sport when you need complete power, Eco for excellent fuel efficiency and City for a balance between the two. Isn't that just simply mind-blowing? It is a new feature, not seen in any other car in India yet. I'm sure it will help me save money, as I save on the fuel! 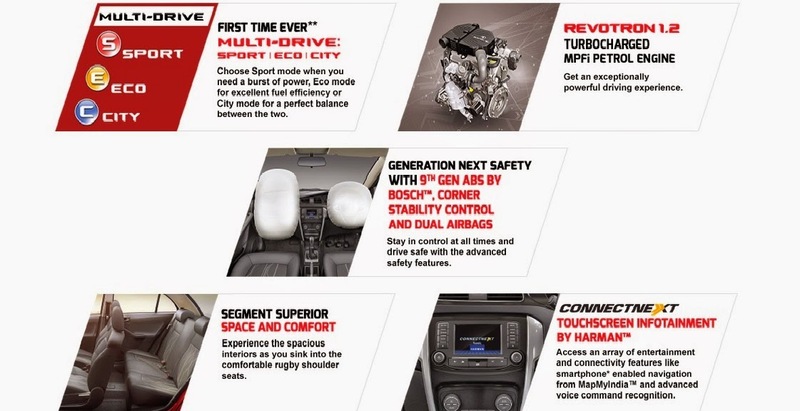 Dual air-bags, child-lock facility, corner stability control are really important features. I would feel much more secured to know that my family and I are protected in-case some weirdo suddenly changes lanes or I need to suddenly apply brakes or drift in case of an emergency. With a new baby in the house, the child-safety lock is a feature I absolutely need. Harman & JBL are my absolute fav when it comes to quality of sound. The all new TATA BOLT has partnered with Harman to put in a touchscreen panel that takes care of navigation, music, voice command, sms readouts and much more. It makes the car a smart-car! The sales executive explained awesome features like the steering wheel can be adjusted at three different heights, a small tray beneath the co-passenger seat, a glove compartment so big that it can fit a netbook / small laptop. 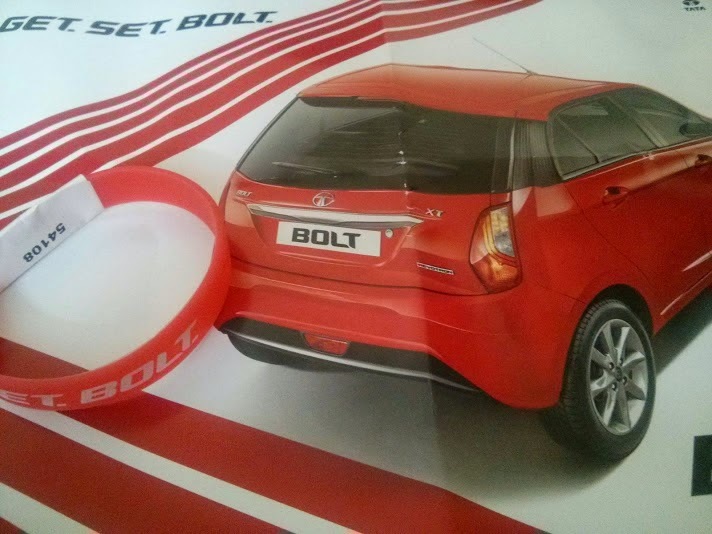 The BOLT is a majestic looking car, looking just gorgeous in it's red variant. I am eager to know what are the other colours it launches in, but as of now it looks awesome the way it is! It has a new signature front grille and projector headlamps. The interiors are pretty swanky and chic too. Sat in front as well as behind, both were comfortable, seats as well as leg-space; something that is sometimes lacking in hatchbacks. Can't wait test-drive the car (which I registered for at the mall) and hope to get extremely lucky and win it! 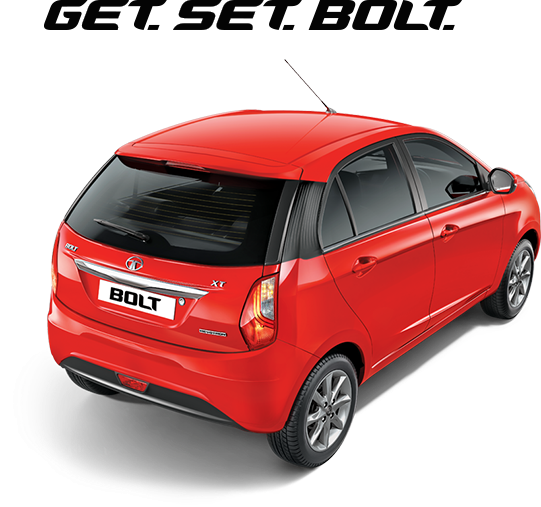 This new year got even more powerful, all thanks to the TATA BOLT. Disclaimer: This post is a part of the Get. Set. Bolt. activity at BlogAdda.